For most banks of today it’s not enough to have a burglar proof safe. What happens if unforeseen events come about? And who – for instance – has to supervise the flow of control data for the building service? Swiss banks are well known as being especially successful in the domain of financial service enterprises with worldwide activities. Providing those services and ensuring the highest quality of service has traditionally been a top priority. This means it is especially important to have a sophisticated infrastructure, which enables the use of the most modern technical equipment within the area of central control and for the monitoring of security relevant organisations. As a major improvement in security the first integral control and monitoring concept has now been realised by one of the leading companies of the industry. This system not only allows reporting of the actual condition within strong-rooms but also checks access to control equipment. A solution to these special requirements was achieved with the EMKA ELM System (Electronic Locking and Monitoring), especially developed for electrical control equipment. The demands of the Swiss initially included the logging, analysis and display of climatic values inside strong-rooms (temperature, atmospheric humidity, water). In addition the devices and control equipment were required to give a status signal e.g. overstepping of a temperature limit, and all event messages had to be included into a seamless logging process. A great number of variable settings was necessary to generate alarm signals. These alarm- traps were to be displayed by means of a SNMP protocol in the superior management system HP-Openview. A communication module, fitted with RS232 and Ethernet interfaces, is the core. Via this module access to all other modules is possible. A Real Time Clock (RTC) and an additional memory allow the logging of all events of the system that remain stored even in case of an electrical power outage. The status of the complete system is displayed anytime by two central alarm relays, which allow the forwarding of all alarm events. The transmission protocol SNMP ensures the integration into the superior management system HP-Openview. 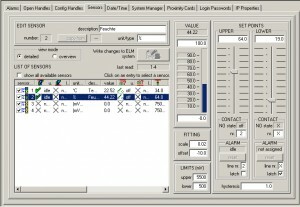 The integral Software ELMcontrol provides a great number of individually settable parameters and options supported by an integrated system. Selected structures and definitions are clearly arranged in a Windows look-and-feel view. 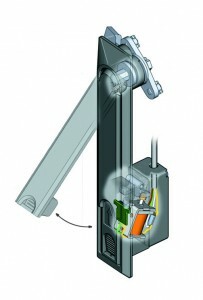 Further components are: a control module for the connection of building services and the necessary sensor modules. All these modules together are placed within a 19” rack (1 unit), with external display at a control centre via a special LCD panel with an individually developed Software suite to manage all requirements for an instant visual display. For a system extension it is envisaged that further racks or individual modules can be easily added, which will then allow for example, the control of access to the individual switch cabinets by control and monitoring of the locking unit. Also possible is an integration of further sensors for the detection of smoke or movement. All modules are connected by CAN-Bus, which may be extended by adding up to 256 individual modules. For exchange of sensitive data between the modules all data is fully encrypted. From here all system messages and alarm signals are forwarded to the superior management system via SNMP protocol. Flexibility, sealability, SNMP protocol and compatibility with HP Overview were all convincing arguments for the Swiss managers who have always been regarded as largely conservative. 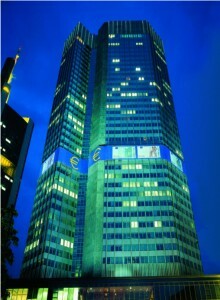 SINIUS (Düsseldorf), previously outsourced from Deutsche Bank AG and now an important IT-Service Company of the industry, can now be counted as users of the progressive ELM system technology. At different SINIUS-locations access is especially controlled and 19”-server cabinets are monitored by an integrated ELM-system. Office doors are also subject to supervision by the system. The server cabinets are fitted with electrically opened swing handles including solenoid and mechanically operated latches. Operation may also be arranged via keypad, proximity card, mobile telephone or network-management-stations. Control and sensor modules allow a controlled access and ensure the monitoring or logging of all events. Very shortly after the introduction of the temperature control system, it was found, despite air ventilation and cooling systems inside the server cabinets, that the temperature load was very high at certain times. This enabled a remedy to be found in time even before any failure reports had been received. In many different sensitive areas the electronic supervision of control systems today requires increasing attention. Particularly in server parks and in the field of telecommunication or system control, the use of integrated monitoring and control modules currently attracts a great deal of attention. 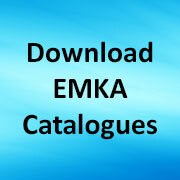 Indeed specialists at EMKA estimate the increase of installations is likely to be tenfold within less than 12 months. Share the post "Greater Security for Sensitive Areas in Financial Services"